The late William Thurston helped bring about “The Death of Proof” (Scientific American Blog). You might say that there is a lot of math that can be proved, and maybe if if can't be proved, its not math! That is true and it depends what you mean by "proved". In Godel's theory most of math can not be formally proved in systems that do not contain contradictions themselves... so are those proofs valid? We act as though they are... And how is this different from physics where it is all conjecture based on experimental evidence and if a new set of experiments comes along that break the old theory we bring in new ones. There is a school of experimental math that works a similar way using computer programs to both create experimental data and to do formal proofs of the conjectures. 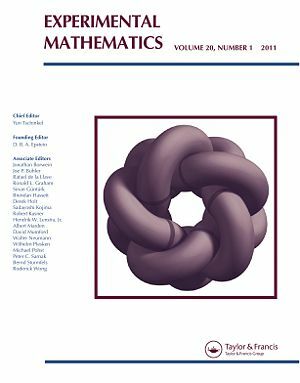 They even have a journal about experimental math now, so it is getting quiet popular. This entry was posted on August 25, 2012 at 12:56 PM and has received 1152 views. There are currently 0 comments. Print this entry. When I studied math there wasn't much about it on the internet. You had to go to a college for classes and to the library to read textbooks and papers. Now there are all kinds of math resources online. I think this lessens the need for universities and academic journals. When people can share and solve problems online, publish papers on their blog or arXiv and even put textbooks online then knowledge is liberated! MIT - math lecture notes and example sheets. Some are full OCW Scholar courses that are designed for independent learners who have few additional resources available to them. These courses include exam solution notes, online study groups, video and simulations. Udacity - free video lectures, online tests and learning community mainly related to applied, applicable and computer science topics. Indian professors' free video lectures along with Lecture Notes and references (Select "Mathematics" from the list of courses available). Princeton Companion to Mathematics - an encyclopedic overview of pure math and some theorical physics with chapters on proof, many areas of math and biographies of famous mathematicians. This entry was posted on June 4, 2012 at 8:19 PM and has received 1423 views. There are currently 0 comments. Print this entry.